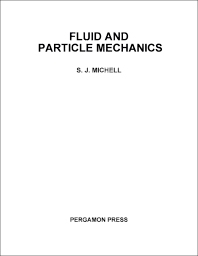 Fluid and Particle Mechanics provides information pertinent to hydraulics or fluid mechanics. This book discusses the properties and behavior of liquids and gases in motion and at rest. Organized into nine chapters, this book begins with an overview of the science of fluid mechanics that is subdivided accordingly into two main branches, namely, fluid statics and fluid dynamics. This text then examines the flowmeter devices used for the measurement of flow of liquids and gases. Other chapters consider the principle of resistance in open channel flow, which is based on improper application of the Torricellian law of efflux. This book discusses as well the use of centrifugal pumps for exchanging energy between a mechanical system and a liquid. The final chapter deals with the theory of settling, which finds an extensive application in several industrially important processes. This book is a valuable resource for chemical engineers, students, and researchers.